The origin of the game is probably the Fifth century, in China. The rules of the game are quite simple, which makes it easy and fun to play, even by children. The game object is to conquer opponent's lair (D1 or D9) or eat all enemy animals. 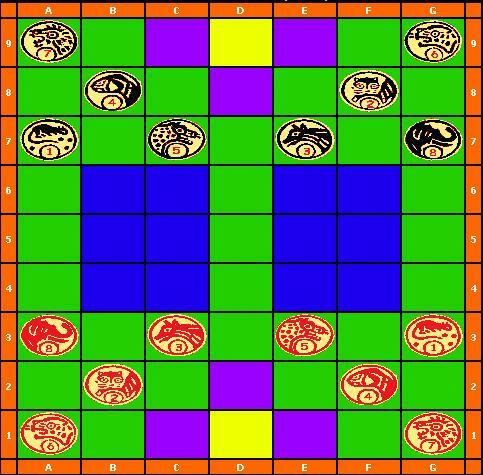 Each players starts the game with 8 pieces (detailed below). The game is played on a 7x9 board. White starts the game. Then black plays, and so on. The basic movements for all pieces is to move one case horizontally or vertically. A piece can capture an opponent's piece if it's stronger or of the same type. A captured piece is definitively removed from the board. The elephant is the strongest piece. It can capture all piece EXCEPT the rat. However, the elephant has a weakness: besides being captured by the opponent's elephant, it can also be captured by the rat, which is the weaket piece from the game. Of some sets of pieces, the number 8 stand of the piece, making it easier to memorize. Being number 7, the lion can eat all piece with a smaller or equal number. He can thus eat: The opponent's lion, tiger, leopard, dog, wolf, cat and rat. Besides the basic move explained earlier, the lion can jump over the water (blue squares in the middel of the board). It means that if it stands next to a blue square (for example F7) and the corresponding target square behind the water (Vertically or horizontally, depending of the starting square, thus F3 in our example) is empty or occupied by an animal it can eat, the lion is allowed to perform a jump move. However, the lion cannot jump if a rat (player's or opponent's) is blocking the jump path. In our example, the lion cannot jump if a rat is standing on F6, F5 or F4. The tiger has the number 6 in power. He can thus eat: The opponent's tiger, leopard, dog, wolf, cat and rat. The leopard has the number 5 in power. He can thus eat: The opponent's leopard, dog, wolf, cat and rat. The dog has the number 4 in power. He can thus eat: The opponent's dog, wolf, cat and rat. The wolf has the number 3 in power. He can thus eat: The opponent's wolf, cat and rat. The cat has the number 1 in power. He can thus eat: The opponent's cat and rat. With it's number one, the cat is the weakest piece of the game. He can then be captured by all pieces and only eat the opponent's rat. However, the rat has also the abilty to eat the opponent's elephant and to move in water. When moving out of the water, the rat cannot eat the opponent's elephant (to do that, he must start from a 'dry' square), but he can it the opponent's rat. Moving your rat in the water can also prevent the opponent's lion an tiger from jumping over the water. * Any player's animal standing in opponent's traps (The 3 colored squares around the lair) can be eaten by any enemy animal, even by a mouse. But an animal standing in one of its own trap keeps all his abilities.